Sometimes you need angels on wings to get you the help you need. The pilots at Hope Air may not be angels, but they have wings, and they use them to give non-emergency medical flights to those who need help in the far-flung locations of Canada. While fundraising often pays for commercial flights so people can get to Canada’s cities and get the medical care they need, volunteer pilots often fly patients in their own planes. Helping out with the cause is Dave McElroy, a Kelowna pilot who touched down briefly in Pitt Meadows Regional Airport, Friday. 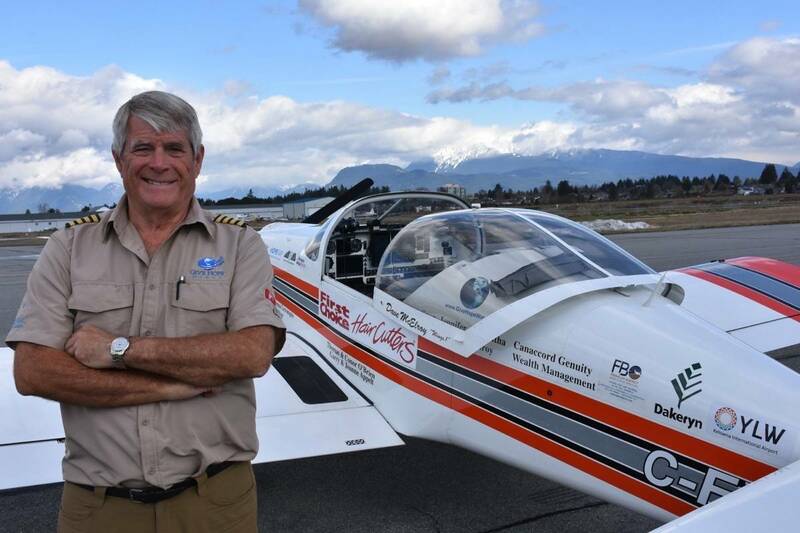 McElroy had just returned home from a two-month, 20-country circumnavigation of Central and South America to raise awareness for his cause, Give Hope Wings, which fundraises for Hope Air. So far, his and others’ efforts have raised $500,000 for Hope Air. The tour involved two planes: Wings 1, a kit airplane known as a Vans RV-6, piloted by McElroy; and the other, Wings 2, a Vans RV9A, flown by Russ Airey and co-piloted by Harold Fast. The aircraft left Canada Jan. 2 and spent more than two months in the southern hemisphere, flying 38,000 kilometres and wracking up 155 hours of flying time. “It was wonderful,” said McElroy. “We were welcomed with open arms.” The pair even got to fly in an airshow beside the Brazilian aerobatics team. McElroy was just making a quick stop in Pitt Meadows, his first stop in Canada before heading back to Kelowna Friday afternoon. However, there was no fuel at the airport, so he had to make a detour to Langley airport, to refuel before heading home. Former Canadian astronaut Roberta Bondar is the official patron of the Give Hope Wings project, which was tracked in real time via GPS on their website. Another goal of Give Hope Wings was to raise the profile of aviation in Canada. “We share the belief that most people are limited only by their own imaginations, and that one of the biggest constraints on many lives is an unwillingness or inability to imagine a bigger and better future for ourselves,” says the Give Hope Wings website.